The organization of the tournament has come to an end. Everything is ready, are you? You only have a few hours left before discovering Update 1.62 and the new Nations. Even when it is time to say goodbye to the old Nations, it is not too late for us to thank them! Come and discover what awaits you in our latest update that arrives on Tuesday! Update 1.62 is coming soon! As with Nations, the update will see in-game Boosters get a new look. Christmas is on its way at Ankama as well and to get started with the festivities, we have prepared a video to present our program for the end of the year. The Christmas Lottery is here and, with it, the chance to win awesome WAKFU goodies! You were waiting for it, you're here, it's here ... it's! End your fights in style with the Sadida Finisher! Through December 3, this new fatal blow is offered for free when you purchase a pack of 13,000 OG or more or in flash sale at 4,500 OG. Contrary to what the name might suggest, it isn't a boss, nor a threat endangering the World of Twelve: It's Black Friday in the Shop from November 23 to 25! What does that mean? 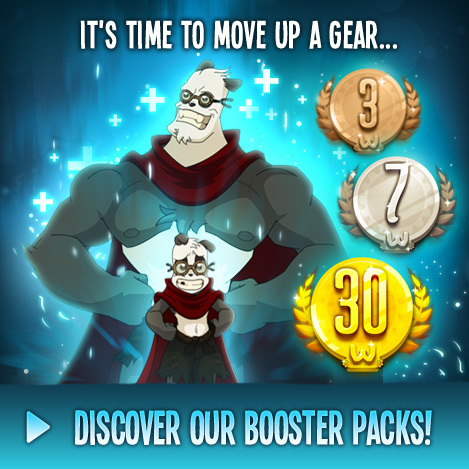 Between 30% and 50% off purchases paid in Ogrines! The Beta server has been updated on Wednesday, November 21. Check out the new features and changes, and share with us your feedback! The wheel is turning among the classes as they take turns staring in Booster Packs. After the Foggernauts and their ability to vaporize their enemies, here come the Masqueraiders, those masters of disguise and revenge! The Masqueraider pack will be in the shop until Friday, November 30! It was barely two o'clock in the afternoon when an old lady burst into the Sufokia militia station, panicked and crying. She stumbled forward and stopped in front of the desk closest to the entrance. That not-so-bad-bad-guy in Wakfu the Series is being honored this anniversary month. But disturbing Nox in person is out of the question. So instead, you have a date with the Noxine pet, his worthy representative, until November 20! Wakfu the Series's 10th anniversary celebration is going strong with an emote straight from season 3: "I am Oropo"! Check it out until November 19.